The primary ritual tool of Tantric Buddhism is going under review. From the ancient battlefields of Asia to the highest Tantric ritual of the Vajrayana, Mitch will engage the history, culture, and uses of this ritual tool. Used by shamans throughout the Asian continent, the Vajra is utilized in shamanic healing rituals. Mitch personally first encountered the 'diamond sceptre' while living in Nepal in the early 70's in his studies with the Jankhri shaman Kum-al-Ra, and again while living at Tangboche, the Nyingma monastery near Mt. Everest. Mitch will share his personal insights of working with the Vajra for nearly 40 years, as well as taking students into the world of the highest Buddhist tantric ritual. Prepare to go where most westerners have never gone with this instrument. The Vajra embodies the thunderbolt in all activities, it's nature is indestructible and immutable. It adorns practically every ritual piece of Buddhism. As the adamantine sceptre of peaceful divinities and the indestructible weapon of wrathful deities, the Vajra symbolizes the male principle of skillful means. Also known as Dorje in Tibetan, it implies that it can never be broken or cut. It's time to get down to business! This segment of the Vajra Master Class will conclude any unfinished business from part one, and then present an examination of the highest Tantra of the Diamond Path. Part one of the Practicum is not required, but it is recommended that part one be taken in order to experience the perfuming of the knowledge contained in this program presented by Mitch. Comment from the Instructor: " This short 2 day Master Class will cover practically everything about this Tantric ritual piece, including the highest of all the Tantras- the Hevajra. 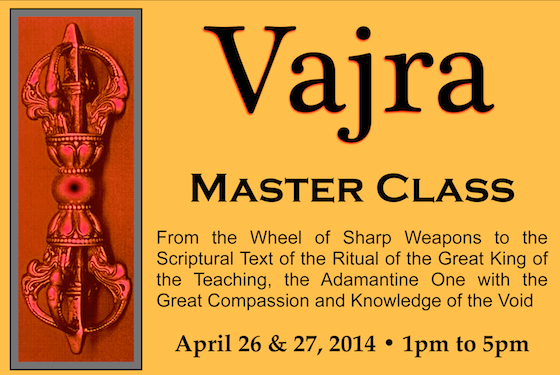 I will be bringing a large portion of my personal Vajra collection to use as teaching aides. I have not taught this program in 4 years, and like my earlier program on the Phurba, the esoteric nature of these types of pieces, ONLY needs to be taught occasionally, to students that have a fire in the heart. You can't learn this piece from a book, or some self appointed teacher who has channeled this instrument. The very nature of the 'Lord of Stones', prevents this type of dribble. I will be showing various techniques of it's use, both traditional and non traditional in nature, including how to use the ritual piece for scanning, clearing energy, and more." Mitch has been a student of the Vajrayana or Path of the Lightning Bolt for nearly 4 decades, his Tibetan name is Men-ghak Rinchen, given to him by his Root Teacher, which means 'precious esoteric wisdom'.